HAMBURG, N.Y. (WIVB) — Thirteen year old Christian O’Connell of Hamburg was born with cerebral palsy. 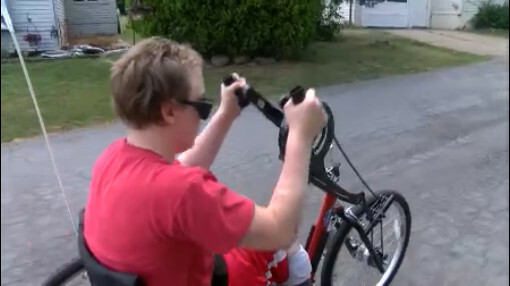 He’s always wanted to ride a bike but hasn’t been able to until now.“My feet due top cerebral palsy aren’t able to properly pedal a bike the right way so with the hand cycle I can just use my upper body muscle,” said O’Connell.Two wheels in the back, one in the front, and a strong set of arms are all Christian needs to ride his new special bike. “The smile on his face, the happiness, it did so much for him and he loves it. Everyday we go around like 5 blocks now,” said Nancy Bemish, Christian’s grandmother. Due to Christian’s mild to moderate cerebral palsy he can’t stand or walk on his own, and relies on the help of wheelchairs and walkers to get around. But about two weeks ago a special custom made hand cycle bike he received opened up a whole new world to him. “With this he gets to go out he gets to ride over to his friends house he can ride around and do things that he couldn’t do before,” said Bemish. He qualified for a special grant through Athletes Helping Athletes.It gets him out of his wheelchair and gives him a sense of independence. “It’s a fantastic bike it’s great for people with cerebral palsy and other physical disabilities that can’t do many things themselves,” said O’Connell.